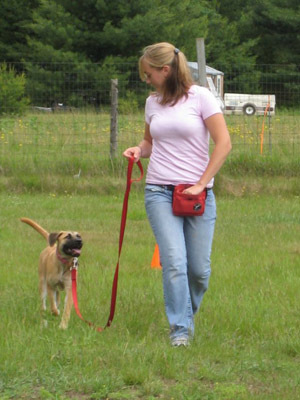 Thompson School Applied Animal Science alum and dog trainer, Laura Chapman, who goes by the name Miss Behavior, talks about her experiences at the Thompson School and beyond. Growing up, I had everything from dogs to cats to mice, turtles, frogs, and birds. Throughout elementary school, I was the girl known for her Border Collie obsession, her Littlest Pet Shop collection, her homemade cardboard houses for her pet mice, and the first 6th grader to ever refuse a squid dissection. While I loved and grew an attachment to all animals I came across, I still wasn’t quite sure how to answer the age old question, “What do you want to be when you grow up?” I had thought about everything from teaching to veterinary work to opening and running my own business, but never quite knew how to do it all. In my 8th grade yearbook, my future goal was to start a chain of animal shelters, helping with the rescue and rehabilitation of homeless dogs. I graduated from high school in 2003, with a class of only 98 peers. From there, I entered UNH as an undeclared Freshman in the College of Life Sciences and Agriculture. I started my freshman year in Chemistry and Biology, along with 400 other freshman. I soon became lost and overwhelmed. Two weeks into the semester, I heard about the Applied Animal Science Associate’s Degree Program at UNH’s Thompson School and it didn’t take long before I was sitting down with my new advisor, Dr Jerilee Zezula, talking about how I could catch up with the class in my new program of Animal Science, with a specialization in Small Animal Care (now called, Companion Animal Science). Throughout my two year program at Thompson School, I met great friends, learned animal CPR, groomed dogs for credits, vaccinated sheep, did a lot of studying, and interned at the NH SPCA both in veterinary technician work and as a dog training assistant, helping to teach classes. After Thompson School, I transferred my credits to the Baccalaureate Program at UNH, studied abroad for 6 months in Australia, and received my BA in Psychology, which complemented my earlier degree. Today, just 3 years after graduating, at 25 years old, I’m following my dream and am entering my third year of owning my own business. This was something I never could have done without the opportunities presented to me by my hands-on education and all the great teachers I was fortunate enough to learn from. I run my own business and go by the name “Miss Behavior”. I’m a Dog Trainer and Behavior Specialist. Not only do I have the opportunity every day to meet new people and new animals, but I am an animal advocate, a teacher, and a business owner. I have a mortgage, a serious relationship with another UNH graduate, great clients and friends and I share my home with two dogs, two cats, and two pet goats. I’m on the Board of Directors for Canine Guardians For Life dog rescue and the Rochester Dog Park, a full member of the Association of Pet Dog Trainers, and a certified Canine Good Citizen Evaluator. I am grateful every day for every person and every opportunity that has allowed me to turn my passion into a career. What more could a girl like me ask for?